Before I took on my BIG challenge for today I noticed that I needed to clean up my cuticles. My cuticles have always been dry and I usually loosen them then trim them. This time I decided to try a cuticle remover and start using cuticle oil after a polish. This required a stop at my local Sally's to obtain the right materials. I like the California Mango Cuticle Remover. It did a really nice job loosening my cuticles from my nails making it easier to push them back and then trim. I know that their are people out there that are completely against trimming cuticles but I think that it makes my nails look so much better. 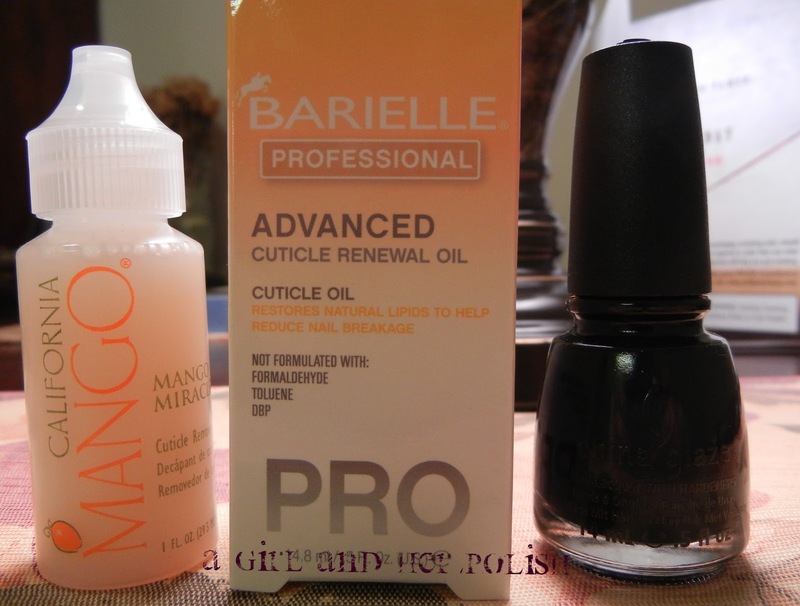 I plan on trying out the Barielle Cuticle Oil after my polish application. Hopefully this will help with my extremely dry cuticles! I also bought a new black polish because I realized that the only black polish I have is the O.P.I. mini that I used for my Halloween dotting. My new black is China Glaze Liquid Leather. This seems to be a very popular black so I thought I would give it a try.